TGIM everyone! Here is your first full shot of the literal big bad of Mission 005! If you’ve been paying close attention to the newspapers on the walls you will know him as Commander Drunkov of the once great Soviet military. Drunkov is (very loosely) based off my former boss from when I was working at a liquor store. 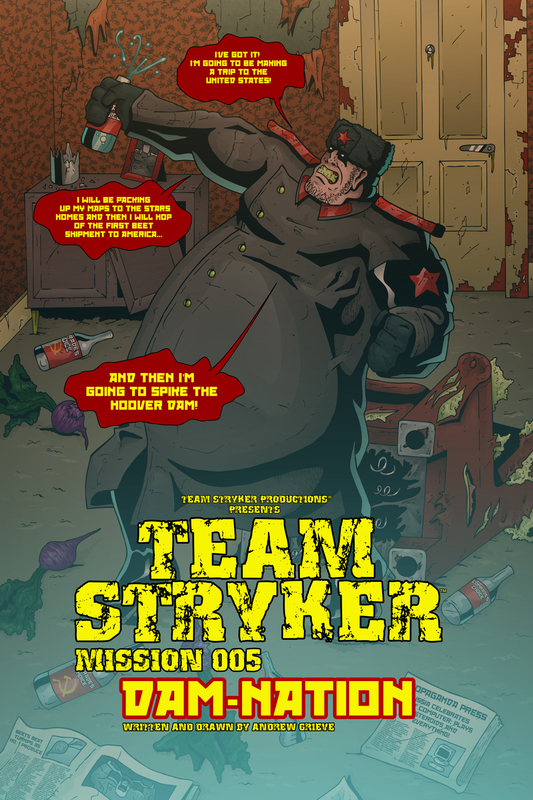 My boss was very generous and let me sell and work on Team Stryker when it wasn’t busy with the condition that he would get to be a villain in a future issue. When a man that is about 6’7 and 450 pounds makes a demand like that you answer “yes”! While my boss isn’t Russian and doesn’t have any plans to spike the Hoover Dam (that I know of) he was the perfect inspiration for Drunkov. I designed Drunkov while I was at the Calgary Comic Expo back in April and have been working on Mission 005 ever since. The issue is 3/4 of the way finished and is on track to have a smooth release over the next several weeks. Check back on Wednesday for your next Team Stryker update!